← How Should We Think About Immigrants? My wife and I are just back from a week on a large lake in Quebec. We left our car in a gravel lot that was slowly surrendering its borders to the encroaching wilderness, loaded our gear on a boat and were carried off to a cabin a few miles away. It was our first time on this 70,000 acre lake, and as we made our way to the cabin I tried to store the shoreline and islands in memory. It’s surprising how hard that is to do. One pine tree looks pretty much like the next, and each rocky island is virtually interchangeable with every other one. It’s an easy place to lose your bearings. A strong front came through the night we arrived and high winds kept us off the lake the following day. The fishing was slow the day after that, so I determined to get up early the next morning to see if I could do any better at first light. There was enough light to see by 4:30 the next morning. I got up, made some coffee and was in the boat around 5:00. I knew where I wanted to fish: in a bay that ran a mile or so to the north, and lay on the other side of a nearby point, just east of our cabin. As I pulled away from the dock, the clouds began to break up. Steam was rising all around me from the water’s surface. 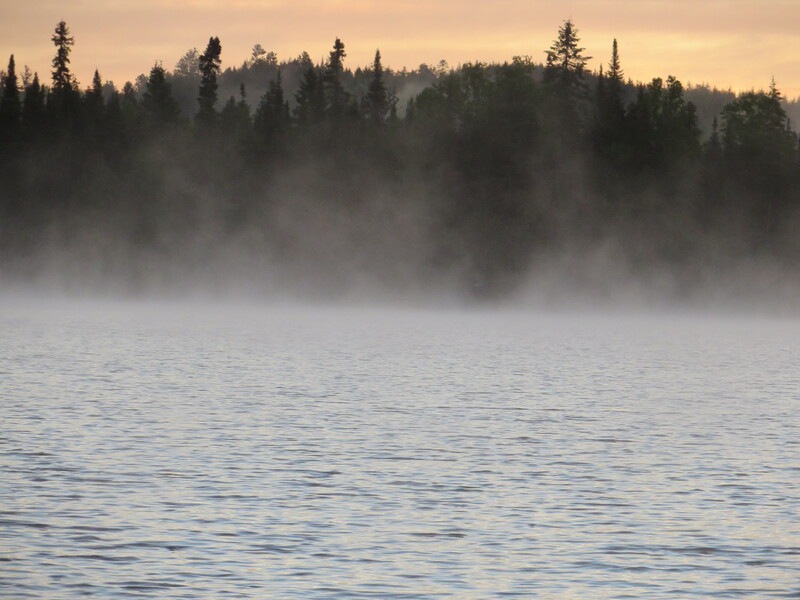 A loon was calling from somewhere in the fog. 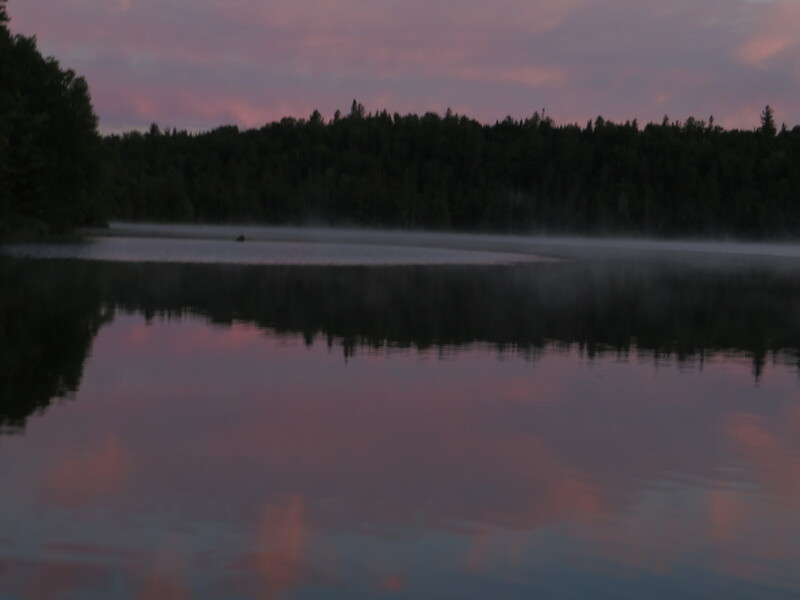 As I drove the boat, I felt I must take some pictures of the fog rising against the now-glowing sky. So without stopping the boat, I retrieved my camera from its case and tried to take pictures, then check the display to see if I was capturing the scene. I was disappointed with the results, but I kept trying. I turned the boat further north as I rounded the point on the way to my destination, but stopped dead in the water a few moments later. I didn’t recognize anything. This was not the bay I meant to enter. I had missed a turn. I had been distracted. Even on a remote Canadian lake, I couldn’t escape distraction. That’s because we carry our distractions with us. We are the distracted generation. The word “distract” comes from the Latin participle “distractus,” meaning “drawing in different directions.” We are being pulled apart, which is pretty much the story of life in the twenty-first century. Our work draws us away from our families, while our cell phones draw us away from our work. We divide our attention between our spouses and the television, our children and the tablet. We lack focus. Our brains are partitioned into sectors, and we try to operate from all the sectors at once. There has been a major campaign in recent years to raise awareness of the danger posed by distracted driving. I suspect that many of us who see the ads or listen to the presentations are too distracted to receive much benefit. And that brings us to the core problem: the distractions are not just “out there,” singing their siren call to us. They are “in here.” If there were no cell phones, no iPads, no tweets or Facebook’s posts, we would invent our own distractions. Why is that? Why is it so hard to live in the moment? Why can’t we listen to the birds singing and watch the sun go down without checking our Facebook page? What is it about humans that always draws us in a different direction from the one we’re facing? 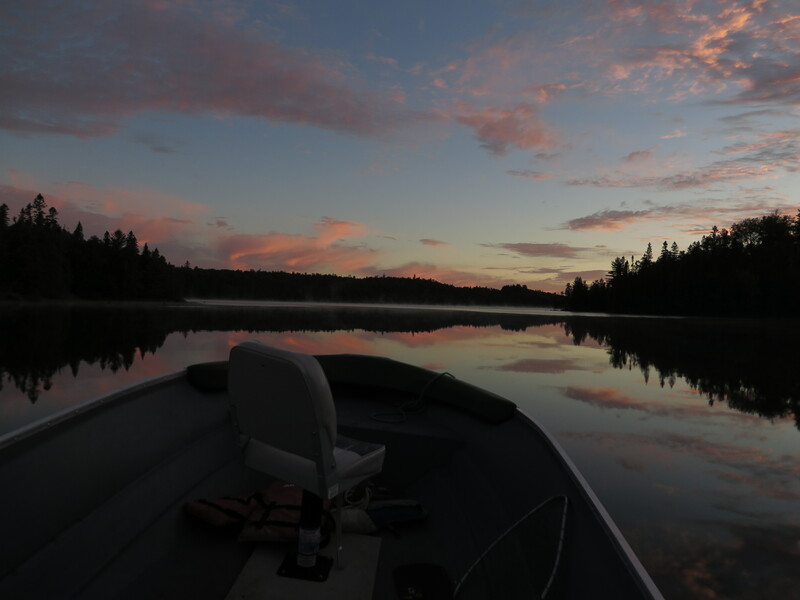 This entry was posted in In the News, Lifestyle, Spiritual life and tagged distraction, fishing, live in the moment, mindfulness, Psalm 86:11, Quebec. Bookmark the permalink. 2 Responses to Why Is it so Hard to Live in the Moment? True, but this is also an excellent example of the opposite tendency: the single-mindedness of a writer/preacher who can recognize an article/sermon in everything that happens to him, even when he’s on vacation. I hope it was a relaxing week! You nailed me, Ron! But yes, it was a good week. Caught very few fish, got blown off the lake and couldn’t get the cabin warm enough for a couple of days. Wondered some times if the spots on the sheets were moving or not, and yet … we really enjoyed ourselves. On a big lake with a map and a compass and beauty all around – it’s one of the things in life I really enjoy. We took lots of books and my guitar, and had several good hikes on trails through the vast forest.